You can make these cocktails. Start right now. I made eggnog this season, for the first time. It was a revelation—I had no idea that homemade eggnog was so different from the commercial stuff, or that it could taste this good. So how will the eggnog you make at home be different from the grocery store product? For starters, it will contain real eggs. It will not have preservatives, laboratory flavorings, or stabilizers, and only minimal sugar. It will be fresh, light and open, just eggs and dairy and your favorite spirits—the way it’s been made for hundreds of years. 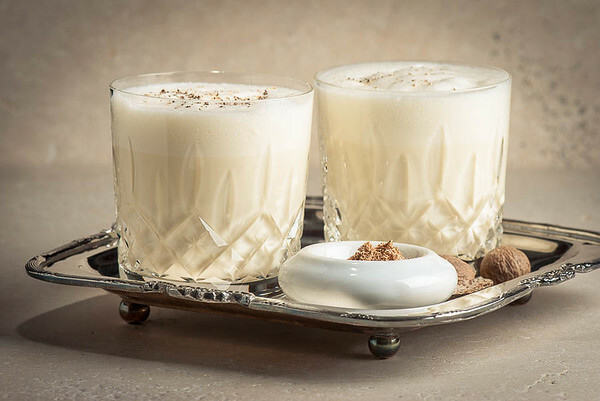 Eggnog has been a winter drinking tradition in the United States since the early eighteenth century—George Washington famously served a very potent holiday eggnog at Mount Vernon. The drink’s narrower association with Christmas and New Year’s celebrations is more of a nineteenth century thing, but shows no sign of fading. Historians are generally agreed that modern eggnog is descended from the much older “posset,” a milk and wine combination that probably would have been familiar to Chaucer, and which evolved over the centuries into a way for well-heeled Europeans to show off with their cream, eggs, wines, and brandies all at the same time. Colonial Americans had plenty of dairy and eggs; better yet for modern eggnog, they had not only brandy, but ample supplies of rum and whiskey. Eggnog was affordable and easily made, and became very popular. The recipe I use is based on one from Dale DeGroff’s The Craft of the Cocktail (2002). Beat the egg yolk well until it turns light in color, adding half of the the sugar as you beat. Add the milk, cream, and liquor. Then beat the egg white with the remaining sugar to soft peaks, and fold into the mixture. Grate fresh nutmeg over the drink, to taste. This cut-down recipe will fill two rocks glasses. The obvious things to play with when making eggnog are the proportions of milk and cream, but the number of eggs and the amount of spirits are easily adjusted to your personal tastes, too. I like this recipe for its lightness, and for its balance of flavors between the eggs, rum, and bourbon. Some recipes suggest that a bit of salt improves the eggnog; I’ve tried it both ways, and I don’t really see that it makes a difference. Many sources recommend that you can make eggnog with pasteurized eggs. No, you cannot. At least, not if you intend to whip whites for the foamy texture. Where I come from, pasteurized eggs are maddening to separate, and impossible to whip into peaky foam. 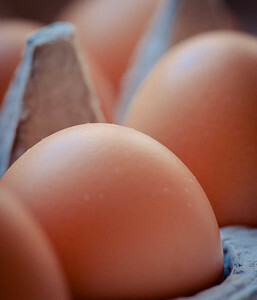 If you’re looking for that light texture, stick with regular eggs. Finally, there’s the question of how long you can or should age your eggnog. I’m new to nog, so the longest I’ve kept a batch around so far is about four days. Starting on the third day, and certainly on the fourth day, the constituent flavors, especially of the bourbon and rum, become less distinguishable; the liquid takes on a softer, custardy flavor. It would be interesting to see where it goes from there, but four days is about as long as I care to keep uncooked egg batter in the fridge. But that’s just me—I have seen suggestions that three weeks is the minimum time required to get flavors to meld, and that eggnog is at its best when it is six months to a year old. Long aging sounds a little dodgy to me, absent very large doses of spirits in the mix; besides, I don’t have enough room in my vermouth-laden fridge to keep a pot around for a year. (Milk, cream, eggs, sugar… what could go wrong?) I’d love to hear from anyone who has actually done this experiment. Aged or not, eggnog is a delightful drink when properly made, and a fine way to share your rum and bourbon when friends gather. “Making Eggnog for New Year’s” at cold-glass.com : All text and photos © 2012 Douglas M. Ford. All rights reserved. I am a journalist and photographer. Once upon a time I had a corporate job; now I don't, which is a pretty happy situation, all in all. People tell me I'm writing a book. I’ll have to try the Nog For Two recipe. My aunt has a recipe that serves somewhere around 12 and involves 3 different spirits…it’s affectionately referred to as “shnog,” as it gets you shnockered. David Wondrich, in his cocktail history Imbibe!, quotes a fellow named Alf Doten, whose diary entry on Christmas, 1871, was, “Egg nog is deceiptful.” Shnockered, indeed. I’m glad you like the recipe; I sort of like that “no cooking” part, too. On the other hand: It “seems” like cooking would provide a level of pasteurization to the mix—that’s the idea behind cooking ice cream batter, which this is, but for the heavy presence of spirits. I speculate that you could make pretty good eggnog if you heated the liquid (before adding the alcohol) to a temperature above 165° F (74° C), the temperature you need to pasteurize a liquid, and below 180° F (82° C), the temperature at which the egg protein will begin cooking; hold the temperature there for a few minutes, then chill as rapidly as you can, and add the alcohol. And all of that may be beside the point, given that you still have to add the uncooked, whipped whites to get that lightened texture. So much for pasteurization… Yup, I like this recipe. Huzzah for nog! I haven’t gotten around to maing any this winter. In the past, I’ve used Jeff Morgenthaler’s recipe (http://www.jeffreymorgenthaler.com/2009/egg-nog/) — simple, and it involves a blender, which seems like Midcentury Modern kitchen sacrilege, I know, but it results in a nice, light, well-mixed nog. I’ve yet to try his tequila-sherry version — time to pop open that bottle of amontillado I have on the shelf. Morgenthaler’s recipe looks good to me—I like the lighter eggnogs, and this one appears to be my style. I’ll look forward to trying it out. Thanks for posting it! I realize the children of the posset family aren’t all that appealing in July, but have you ever investigated Tom and Jerry? The beverage, not the cartoons. Aside from noticing it in passing in Damon Runyon’s “Dancing Dan’s Christmas”, that is. Because it applies similar principles to a beverage meant to be served and consumed hot. Yes! Let me know when you publish! Try a random post from the archives! © 2009-2019 Douglas M. Ford. All Rights Reserved. All Cold Glass text and photos are protected by copyright.